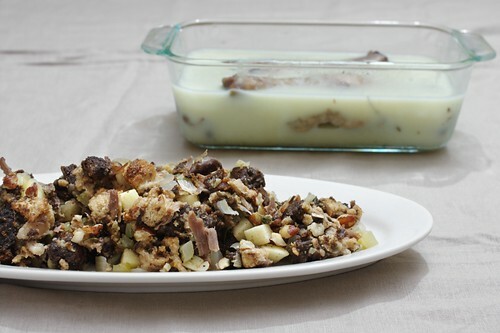 pumpernickel and duck confit stuffing with braeburn apples and hazelnuts, originally uploaded by aarn! +21st November, 2010+. dry cured two duck legs (~1.5lbs total) from sherman market with one finely diced shallot, 1 sprig worth of thyme, a bay leaf, 1/2t. savory, 1/2t. lavender, and 1/8c. salt, overnight in a non-reactive container. rinsed off the legs and seasonings and then patted the legs dry. placed the legs in a vacuum bag with 1/2-pint of rendered duck fat (bella bella birds), a sprig of fresh thyme, the rinsed spices from the dry cure, and one diced small onion. stuck the vacuum bag in a 165-degree thermocirculator (water bath) for 13-hrs. let cool for an hour, then removed the legs from the bag, strained out the spices and aromatics, ladled the fat back into a container in the refrigerator, and set aside the confit jelly. pulled the meat and fat off of the two legs and separated into thin strands (like pulled pork). broke down the skin and fat into similarly sized pieces. placed all of the fat, skin and meat in a container and ladled the still-liquid confit jelly over the top until totally covered. set aside for later in the process. put 1T. rendered duck fat and 1T. olive oil to a 10-in saute pan over medium heat. added 2 diced small onions and 2 diced ribs of celery, and cooked until soft. seasoned with salt, pepper, 3 finely chopped fresh leaves of sage, 2 sprigs worth of finely chopped fresh thyme, 1 sprig worth of finely chopped fresh rosemary, 2 finely chopped cloves of garlic, and two bay leaves. reduced 1/2c. of white wine into the mixture along with a big scoop of confit jelly. mixed in 2 peeled, cored, and diced braeburn apples, 1c. of chopped hazelnuts, the pulled duck leg confit, and 2c. chicken stock. stirred around until friendly. mixed the contents of the saute pan into a bowl containing 8-slices of pumpernickel bread and 8-slices of wheat bread, which had been chopped into stuffing sized cubes. tossed well and then poured into a 3Qt. rectangular pyrex baking pan. placed the pan in a 350-degree oven for 30-minutes, then broiled the top until browned.